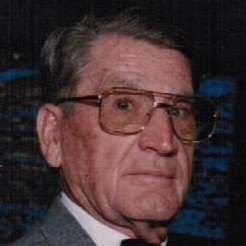 William R. Welsh, "Bill", age 94, of Homestead, on June 10, 2018. Beloved husband of the late Marie (Borellis). Loving father to William (Donna), Nancy (Regis) and Susan (Richard). Cherished "Pap-Pap" of Kerry, Kelly, Mary, Nissa, Samantha, Brian, Ian, Shawn, William. Also survived by five great-grandchildren and 10 nieces and nephews. Bill volunteered to serve in the US Army during WWII. He was one of the last surviving members of the 208th Engineer Combat Battalion, which landed at Utah Beach in Normandy and supported combat units from France to Berlin. He was awarded the American Campaign Medal, European Campaign Medal, four bronze battle stars, Good Conduct Medal, WWII Victory Medal, German Occupation of Berlin Medal, and the D-Day Commemorative Medal. Born and raised in Homestead, Bill founded the William R. Welsh Funeral Home. He was an active member of the American Legion Post 60 and the Veterans of Foreign Wars Post 373. Bill took great pride in serving his country and community. He selflessly devoted his life to the service of others. To his family, he gave his all. He was our rock, our protector, our hero. He will be remembered and loved forever. Friends received at the William R. Welsh Funeral Home, 309 E. 10th Avenue, Homestead, on Thursday 2-4 & 6-9 PM. Mass of Christian Burial on Friday, 11:00 AM at St. Maximilian Kolbe Church.